Catalysts are materials that can speed up chemical reactions that otherwise would take an extraordinarily long time to occur. To do this, catalysts bring the starting substances (reagents) close together and orient them in such a way to promote facile product formation. Often, one reaction requires several of these rearrangements. Additionally, some of these rearrangements are more demanding than others in terms of energy, which influences the overall reaction rate. Using a metaphor, it is like when you are biking; you turn the corner and find a hill on your path. 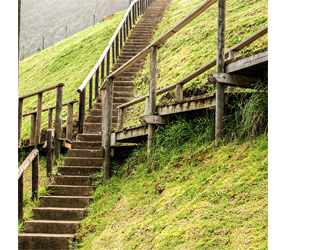 At that point, you have only two possible choices: in the case the hill is not too steep, you can go ahead, using more energy and slowing down your pace. But if the hill is not "affordable," you should reconsider your plans or look for alternative paths. Catalysts are materials creating new paths in a synthesis route. It is the high-demanding energy steps in a chemical reaction that are that targets in the design of successful new catalysts. Researchers at the Inorganometallic Catalyst Design Center (ICDC), an Energy Frontier Research Center funded by the Department of Energy, are particularly interested in reactions involving small hydrocarbons, such as methane, ethane, and propane, which are the major components of natural gas. If these small molecules can be efficiently converted into valuable liquid fuels (that is, if they could condensate to form larger molecules), this could dramatically reduce U.S. dependence on petroleum. Unfortunately, there is no efficient way to do this presently, because there are no catalysts that can operate at moderate conditions for these types of reactions. For example, increasing the value of ethene (2 carbon atoms per molecule) would require “simply” reacting two ethene molecules to form 1-butene (4 carbon atoms per molecule). However, this reaction to 1-butene is very slow and does not provide full transformation of ethene to 1-butene. Looking for candidates. The search for an optimal catalyst can be very time consuming, especially if all of the possible catalysts are synthesized experimentally. Recently, scientists have exploited the use of computational methods as tools to direct synthetic efforts. In doing so, the catalyst screening is done on a computer, and then only the most promising candidates are synthesized and tested in the lab, saving a significant amount of time and money. The calculation of an entire reaction pathway can be daunting, especially if all possible steps are considered. Some of these steps take quite a long time to calculate, especially the transition states. Transitions states are the pivotal moments in a reaction where the bonds of the reactants are breaking and the bonds of the products are forming. 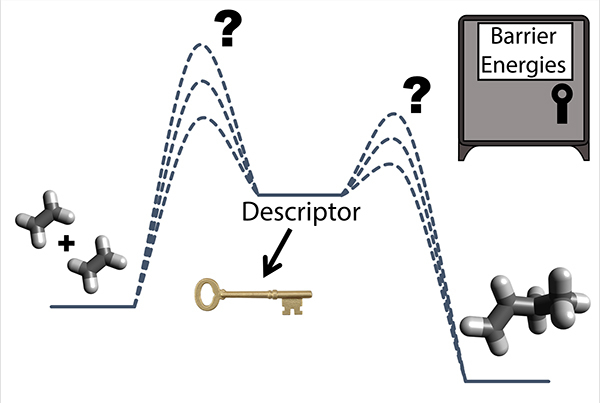 Transition states represent the top of the hill on the path, and the significant amount of energy necessary for their formation (transition state barrier) actually determines if the reaction will occur. Scientists have found that certain catalytic properties are correlated to the transition state barriers, allowing these barriers to be estimated without having to calculate the transition states directly. These quantities are called descriptors, and they are quite unique because they are different for each class of reaction. Lengthening ethene. Researchers at the ICDC have tested -- by computational tools -- several catalysts for the conversion of ethene to 1-butene. Interestingly, they have found that the adsorption energies of two intermediates of the reaction (co-adsorbed H and C2H4; C2H5) can be used as descriptors for this mechanism. Through the simulation of the reaction rate, they determined that only systems having partially filled d orbitals had the highest reaction rates. The results from their screening tests determined that catalysts based on nickel and cobalt, two Earth-abundant metals, would be particularly promising for this conversion, and these results were confirmed by experiments. “This technique allows us to generate a large amount of data on a simple structure that can be extrapolated to more complex catalysts, greatly shortening the length of time needed to start predicting new and interesting catalysts,” said Steven Pellizzeri, researcher at Clemson University and first author on the study. “We applied this technique for ethene. However, it can be readily expanded to any catalytic reaction of interest." This work was supported as part of the Inorganometallic Catalyst Design Center, an Energy Frontier Research Center funded by the Department of Energy (DOE), Office of Science, Basic Energy Sciences. The Palmetto Supercomputer Cluster, which is maintained by the Cyberinfrastructure Technology Integration Group at Clemson University; Quest High Performance Computing Cluster, which is maintained by the Northwestern University Information Technology; and the National Energy Research Scientific Computing Center, a DOE Office of Science user facility. Jenny G. Vitillo is a postdoctoral researcher in physical chemistry at the Department of Chemistry of the University of Minnesota. She is a member of the Inorganometallic Catalyst Design Center (ICDC). Her research focuses on environmentally relevant problems by using experimental and computational approaches applied to systems based on metal-organic frameworks. Longer molecules are more valuable than shorter ones when it comes to making energy-dense fuels. That’s why scientists are looking for fast, efficient ways to create longer chains. One option is to snap together short molecules from renewable resources. The challenge is avoiding uphill reactions that use a lot of energy. Scientists at the Inorganometallic Catalyst Design Center (ICDC) calculated possible synthesis routes and used the data to pick the easiest ones. The data-intense calculations used three different supercomputers to screen out high-energy routes and showed an easier way to create a four-carbon chain using Earth-abundant metals to facilitate the transformation. Such a screening method could reduce the time and cost of finding better ways to manufacture fuels. The ICDC is an Energy Frontier Research Center led by the University of Minnesota. Metal-Organic Frameworks: Is It as Simple as Separating the Big Fish from the Little Fish?